We couldn't be an organisation for Experience Makers if we didn't showcase some of the best examples of what Makers have achieved! Please see below for what we believe to be extraordinary examples of experience making. If you have a project you would like or believe should be featured, do get in touch! 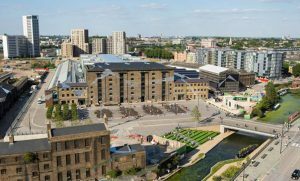 Since 2001 Argent has been redeveloping the King’s Cross area, turning it into a hub of activity appropriate for the best connected location for transport in London. It was once the meeting point for road, rail and river, believed to be the site of the legendary battle between Queen Boudicca and the Roman invaders. The final resting place of Queen Boudicca is said to be under platform 9 at King’s Cross, whilst platform 9 ¾ is famous for being a fictional King’s Cross platform in the Harry Potter stories by J K Rowling, adding to the development’s fame.